I had an inkling something was up as we crept through the Friday afternoon rush on the northern outskirts of Montpellier. But it wasn’t until we were stuck in the narrow Roman streets of Béziers that my suspicions were confirmed. I had fallen victim to a fat-finger error when programming my SatNav. So it goes that what should have been a one-hour drive to Narbonne from Montpellier–Méditerranée Airport became a two-and-a-half-hour mission through the Languedoc’s most frustrating and congested roads. There are surprisingly few alternative routes available when you’re stuck in a traffic jam in the French countryside. Credit to my passenger, who, despite having to endure my complaints about a suspiciously faulty SatNav, maintained optimism that we would reach our destination prior to our grandchildren graduating from university. The destination, Chateau l’Hospitalet in La Clape, is the seat of Gerard Bertrand’s wine business and we were headed there for its annual vine pruning celebration. Most of us approach the task of pruning anything in the garden with a degree of reluctance, keen to avoid it in the hope that someone else will do the job for them. But for the vignerons of France, especially those in the Languedoc, vine pruning is just as important as making the wine itself, so it is important to honour the labour that goes into it. It is also a great excuse for a party. Vine pruning is without a doubt the most difficult task of winegrowers. This meticulous work represents the beginning of the vine life cycle and every winter the wine growers are working to give birth to what will be the fruit of a whole year’s work. It is with these excessive temperatures that on our vines, the wine growers accomplish 15 million pruning movements with infinite precision influencing the next harvest as much as the vine for the rest of its life. It was for this reason that we were headed to Gerard Bertrand’s vineyard for a celebration that included outdoor activities, a wine tasting and a gala dinner. All we had to do was get there. But first we had to endure a drive fraught with calamity. First the wrong route on the SatNav. Then an attempt to deviate from the ill-fated route to find the toll highway only to second-guess my judgement and turn back. And finally when presented with the last opportunity to pull onto the autoroute à péage we found ourselves whizzing by in a blur of confusion and ineptitude. It’s amazing what crosses the mind when you’re stuck in a line of traffic in the centre of Béziers. None of it will do anything to get you to your destination any faster. Even when the only option is to keep pressing on, the mind wills you to give up. To pull to the side of the road and throw the SatNav into the River Orb. To get out of the car and lob obscenities at the traffic that is impeding your journey. It’s not as though I have no sense of direction. Some would say I can read a map and remember a route better than most. And it’s not as though I haven’t driven this route in the past. In fact, I’m well-acquainted with the roads between Montpellier and Narbonne. But I’m also a man of a certain age and, therefore, I’m predisposed to errors not only of the navigational variety but also of the male brain. Get in rental car. Turn key. Pull out of parking lot. Immediately and with blind confidence turn the wrong direction or willingly follow the wrong route on a SatNav. In the end, we made it. But only with enough time to check in at reception and race up to our room for a wardrobe change before heading straight to the restaurant for drinks and dinner. 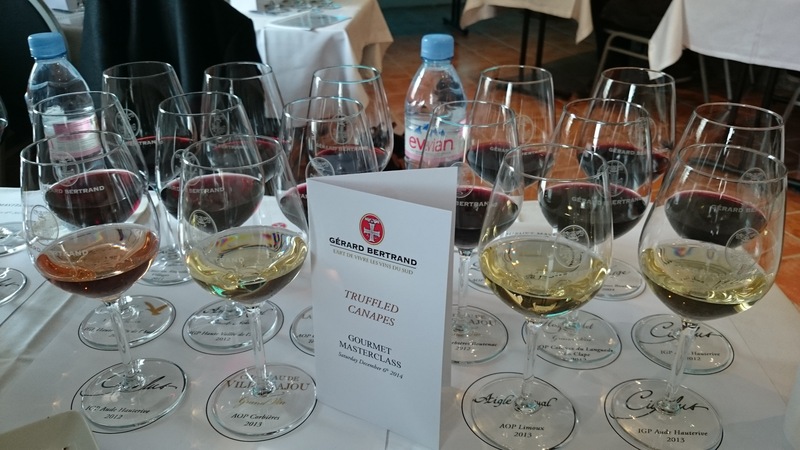 The real work would take place the following morning in the form of a masterclass tasting of Gerard Bertrand’s latest vintages. That will have to wait for next time. When I first heard of the group of wine producers known as The Outsiders, I had visions that they were a band of outcasts akin to those conjured up by SE Hinton or even Camus. I was clearly over-romanticising. The Outsiders in this case are anything but a band of misfits and societal outcasts. Instead, they’re a group of winemakers. All of them upstanding citizens. At least as far as I could surmise. This is a group of winemakers operating in Languedoc-Roussillon who come from all over the world and from a variety of walks of life but, crucially, are not native to the region. What they have in common is their active decision to settle in Languedoc-Roussillon to make wine. There are times when calling oneself an outsider is something to embrace. When it comes to the bureaucratic labyrinth that is the regulatory framework of the French appellation system, being an outsider is often seen as a disadvantage. The stubbornness of the appellation system is no place for an iconoclast, where decades of tradition are preferred over ‘frivolous’ notions of commercial viability, free enterprise and experimentation. Despite this, it seems that these Outsiders have been able to overcome, or embrace, the bureaucratic machine and carve out a niche for themselves. 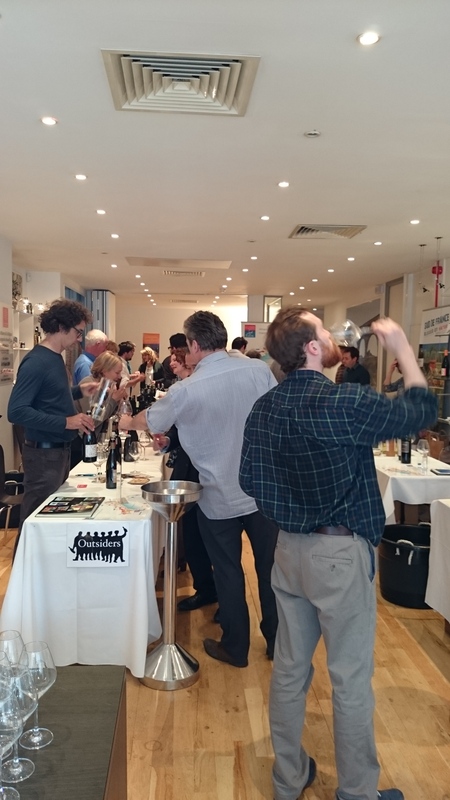 As part of their effort to market their wares to UK merchants, this group of international winemakers (they come from all over the world, from America and Australia to the United Kingdom, Switzerland and yes, within France itself) hosted a small tasting in London back in early May. As a tasting that included a broad range of wines from across the Languedoc region, it is hard to make generalisations or make sweeping statements about the producers. Quality levels were high, but there were obvious differences among the producers in terms of what they are trying to achieve. Some are aiming for affordable, accessible wines, while others are aiming for something a little more profound. In other words, you won’t be having any flashbacks to that time you bought vin en vrac from what looked like a petrol pump behind a dusty shed. 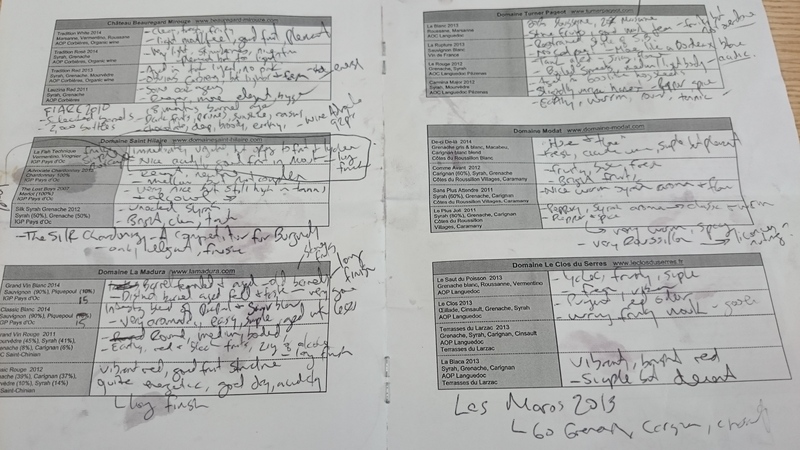 If I’d had the foresight to, say, scribble down scores for each of the wines I tasted, I’d have a much easier time selecting my favourites from this group. But where is the fun in that? Anyway, enough of my digressions. Here are my highlights from a good bunch of wines. Some of these winemakers are still seeking distribution here in the UK, while some are available to buy from various merchants and supermarkets, although I’ll be darned if I can remember which ones. There is quite a lot to like about all of the wines of Domaine Sainte Rose, but if I had to narrow down my choice to just one, it would be Le Pinacle 2012. Consisting of 95% syrah and a 5% dash of viognier, this has the style of Cote Rotie with a lush palate and medium body. It has an attractive earthy character backed up by red fruits and the potential for a long life. La Clape is one of the great wine regions of southern France and this producer has brought some Bordelais swagger — complete with red trousers — to the area. The grand vin is a real pleaser, with a high level of mourvedre in the blend to make a deeper, bigger wine that has an attractive balance of fruit and earthy flavours. I might be at risk of selecting too many ‘top’ wines from this tasting, but this was among the standouts from Chateau Beauregard Mirouze. With 18 months of barrel age, this displayed dark fruits (prunes and raisins) and had a deep, broody, earthy, chocolatey character to it. In many ways it was sunshine in a glass. In the past I was never a big fan of chardonnay from the south of France. At times it seemed flabby, overripe and lacking any real character or complexity. But this is something different. It could very well be a competitor to decent Burgundy, having a healthy but not excessive oak treatment, not to mention a real elegance and finesse about it. Close your eyes and you think you’re drinking something from the Cote de Beaune or even the Cote d’Or. This was a delight, a barrel-fermented, sauvignon blanc-dominant wine.Fermented and matured in older barrels, this older oak treatment is immediately noticeable on the nose, while on the palate it is rich with citrus and stone fruits, and has a long finish. Another white wine that grabbed my attention. This was a lot like a white Bordeaux to me, made of sauvignon blanc but in a restrained style that is free from the more modern take on SB that has proliferated the market. Fresh, mineral and a good match for food. Not a whiff of cat pee to be sniffed. This is warm, spicy and very much a syrah from the south of France. With 80% syrah and the balance consisting of grenache and carignan, this Rousillon displays licorice and nutmeg, with fine tannins and a long finish. A blend of syrah and grenache, this is aged 12 months in barrel and offers up all that is good about Minervois. It is warm, with fine tannins and a backbone of ample red fruits . All of the wines from this producer were excellent, but Les Brancels seemed to stand out to me. This was what was described as the ‘house blend’ of syrah, grenache, mourvedre and carignan. I love the wines of Faugeres and this displayed all the characteristics that keep bring me back: warmth, earthy aromas a flavours, a good backbone of fruit and a fine complexity that pulls it all together. Two other producers that were at the tasting but without a mention here were Le Clos du Gravillas and Domaine Le Clos du Serres. This was for no other reason except that my notes for these producers were a bit too sparse (likely because I was chatting rather than writing) for me to be able to write a recommendation. Gerard Bertrand is a winemaker that is in many ways the exception to the rule. As a fairly large producer, you would probably expect the wines to be good but not exciting. But this is not the case at all. Instead, high quality seems to be present at all levels. Gerard Bertrand’s affordable wines punch above their weight, while the premium wines tend to hit all the right notes, showing none of the negative qualities that wines from other large outfits often produce. At the heart of the organisation is Gerard Bertrand himself, an almost unfathomably tall man who has a soft handshake and a youthful charm. And even though the wine business he runs is modern, efficient and has grown to contain some nine individual estates, he is no industrial magnate. He speaks of the tradition of winemaking, the importance of terroir and his love of the Mediterranean lifestyle and the gastronomic traditions that go with it. In my previous post, I recalled my visit to Gerard Bertrand’s Chateau l’Hospitalet in December. The weather at the time was wet, blustery and cold. But none of that mattered because there was plenty of wine for us to taste. And it was the good stuff, too. After tasting 15 wines in one sitting, I was impressed by the high level of quality. I wouldn’t hesitate to buy any one of them if I found them on a merchant’s shelf, although I would by lying if I said I didn’t prefer some over others. So, without further ago, here is what I made of the wines. My preferred wines are marked with an asterisk. A blend of merlot, syrah and caladoc. Salmon pink with a copper hue. Hints of strawberries and cream with a meaty aroma over top. In the mouth it had medium acidity and was dry with a bit of roundness. In style it seemed more like a white wine than a typical rose. Blend of marsanne, roussanne and vermentino. Barrel fermented. Lemon green in colour. Plenty of lemon and citrus on the nose with peaches, apricots, as well as a creamy oaky/vanilla note. On the palate this is rich and rounded, with citrus and wet stones, along with peaches and apricots. It has medium acidity and a long finish. 100% chardonnay, medium lemon/green in colour. This is an oaky wine with a prominent chardonnay nose that exhibits fresh vanilla and stone fruits. It also has a fruitcake quality that comes through. On the palate it is rounded and oaky, with a mineral quality to it. It has medium acidity and a long finish. Blend of chardonnay, viognier and sauvignon blanc. Medium lemon colour. On the nose, this had a fruity nose that expressed lemon and citrus fruits as well as lychees and grass, and clearly allowed its sauvignon blanc and viognier to come through. On the palate it was fruity but still restrained, showing plenty of citrus with medium acidity and a long finish. 100% pinot noir. This had a spicy nose that expressed vegetal characteristics and a blast of seabreeze. It seemed fairly closed, but there were hints of vanilla. Still clearly in development, it had medium tanning and red berry fruits, as well as medium acidity. This is a fairly basic pinot noir that needed a bit more time to show its true colours. 100% pinot noir. This is a step up from the previous pinot, with an expressive nose of vanilla, red fruits and spices. On the palate it had an enjoyable dose of brambly red fruits, medium acidity and tannins, and a medium to long finish. Still in need of development, this wine gave me the impression that it would turn into something great with a little but more time. Blend of syrah, grenache and carignan. Deep rub red in colour, with deep aromas of black fruits, boiled sweets, spices and garrigue. On the palate it showed more black fruits, plenty of spice and medium tannin. This was extremely pleasant and deep, and would benefit from more time in bottle. Blend of carignan, syrah and grenache. Deep ruby red, with an immediately recognisable Corbieres nose: meaty and with barnyard aromas. This was warm and earthy, with garrigue and something floral, perhaps violets. On the palate it showed sweets, dark fruits and medium tannin. This is a very good Corbieres. Blend of syrah, grenache and mourvedre. Deep in colour with plenty of dark fruits and a hint of oak on the palate. This was complex and enjoyable in a hedonistic way. Aromas of olives, herbs, spices and truffles abounded, as well as something that I can only describe as the warmth of the region. On the palate it was rich and warm again, showing more dark fruits and olives with a saline aspect to it, with medium tannins and a long finish. This will likely develop with time in bottle. Blend of cabernet sauvignon, cabernet franc, merlot, syrah, grenache, caladoc and carignan. This might have been the best wine of the tasting, which is why I bought a bottle to take home with me when I visited the vineyard’s shop before I left. This is deep purple in colour with a spicy nose that expresses dark fruits, racy oak and once again that sense of warmth. On the palate it has yet more dark fruits, medium tannins and a very fresh feel while also being rich and warm. 100% grenache. This had a very typically grenache nose that expressed gum candies, ripe olives and truffles. In the mouth this is rich and viscous, with mild to medium tannins and a soft feel. It had plenty of dark cherries and berries, but a bit of a flat finish. It is well made, but perhaps wasn’t hitting the right notes on the day. Blend of grenache, carignan and syrah. Deep purple in colour, with a gamey/barnyard nose. Very much an enjoyable Minervois, offering up aromas of spice, dark fruits and pepper. In the mouth this was all about dark fruits, with medium acidity, medium tannins and a long, lingering finish. This was among my favourites on the day. Blend of grenache, carignan and syrah. With 13 years of age at the time of tasting, this was deep ruby in colour with some bricking at the edge. The nose was dominated by mushroom/truffle aromas along with dark olives, bruised dark fruits, violets, chocolate, pipe tobacco and marmalade. In the mouth it showed warm dark fruits, more spice and wonderful complexity, along with medium tannins and a long finish. Very likely my favourite wine of the day. Blend of carignan and syrah. Deep ruby with a fairly closed nose that hinted at dark fruits and vegetal aromas. The palate was much more expressive, with flavours of soft dark fruits and boiled sweets, with medium acidity and a long finish. This wasn’t showing all of its qualities but will likely develop into something great with time. Blend of carignan and syrah. Ruby red with a bit of bricking at the edge. On the nose it had aromas of mushrooms, spices and black fruits. There was also the same theme of warmth that many of Bertrand’s wines show, as well as olives, peppers and floral aromas. On the palate it had integrated tannins and an obvious maturity, having had 10 years to develop. There was more black fruits with boiled sweets and fruit gums. A good wine.